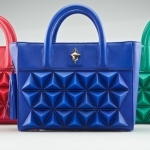 Being the handbag lover that I am, I’m always out on the prowl to find the next “IT” bag! We all know that Hermes and Chanel are recognizable from a mile away and are staple pieces in the fashion world. 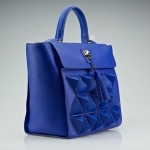 With confidence, I can say that the next handbag that will be joining those classics, and soon will be joining my collection, is one designed by the Bahraini beauty, “Sofia Al Asfoor.” When I first laid eyes on the Royal Blue Classic Shield, I knew I had to learn more about it and the fact that there is only a limited number of those beauties in the world excited me even more☺! Not only is Sofia Al Asfoor an innovative designer, but a complete sweetheart that has given me the honor of doing an exclusive interview with her. I might not have been able to sit down with Coco Chanel, but at least I got to pick the brain of the designer behind the soon to be timeless classic. Mark my words. Now let’s step into Sofia’s world and get to know more about her as a designer and as an individual. Where did your love for handbags begin? It all began at London College of Fashion, the journey to the shield that is. 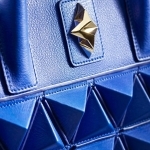 As for my love for bags and fashion design, that’s something that I’ve carried within me since I can remember. I did the famous market hunts for fabrics and made my own designs. Also, I put my hands into whatever came my way in the arts and always loved and communicated in design. 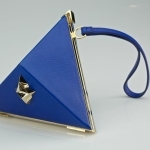 What is your inspiration behind the geometric design of your handbag? 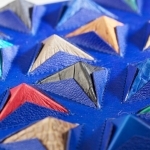 The pyramid came from origami structures, each representing the power within the mind, heart, and soul. It’s something that remains close to my heart and to my personal experience. We all know that Chanel has it’s CC’s and Gucci it’s iconic print, what is the signature of a Sofia Al Asfoor handbag? 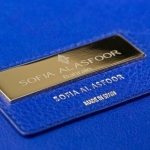 The signature of the Sofia Al Asfoor handbags are found in a few aspects. First and foremost, the shield’s construction and the pyramids. 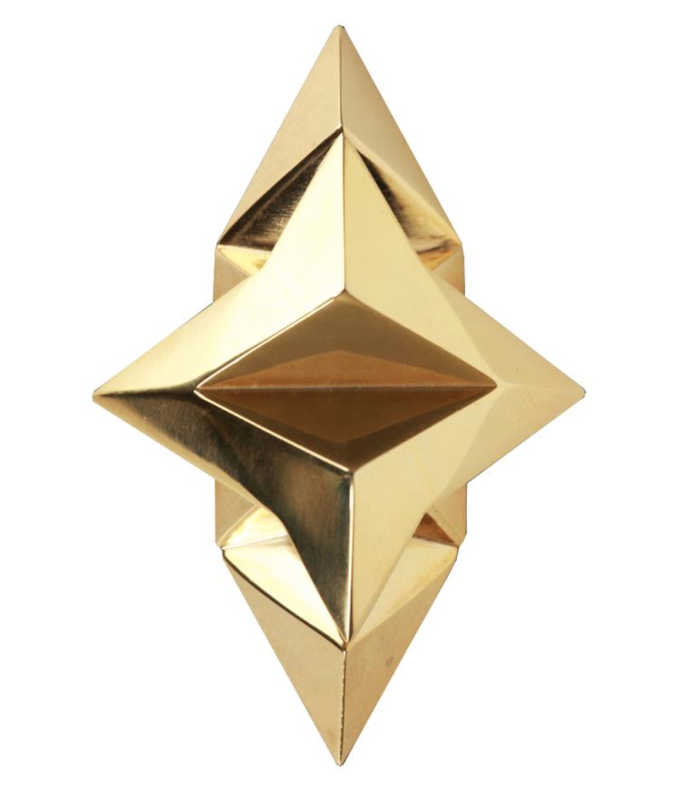 It’s that strong esthetic that runs through the shield collections, and will continue to be apparent throughout. Secondly, the signature color which makes a statement of its own, the royal blue – a tone that stands for power and truthfulness. 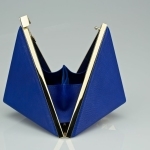 What do you feel you bring to the handbag market that isn’t being done by your competitors? Fortunately, my competitors bring a lot to the table. As for what I bring and have stood out for is a distinct and universal design that remains timeless and forever. The design is very complicated, another aspect which seems to stand out today. It’s technically very difficult to produce in mass. That’s what I believe is true luxury – never really available in excess. Are there plans on opening your own boutiques or bringing your collection to the states and the rest of the world? These are plans that are continuously unraveling. I have recently expanded to the United States. 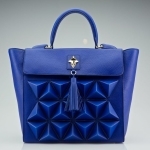 Surely, I do believe I will continue to develop sales points, as I know the market is already out there and ready to take in the bags when they arrive. If we had the chance to take a sneak peek into the handbag you are carrying right now, what are the items we can always find? In five years from now, where do you see yourself taking your business and how do you want your brand to be known? I’ve always wanted my bag to represent the empowerment and the beauty of women, with her complexity and distinct nature. Things have been moving very quickly already, but surely I would like to build on a strong foundation that will allow the shield to continue far beyond my years. What is the market like for new designers such as you in the Middle East? Do you run into more of a challenge not being in Europe or any other Fashion capital? The market in general is very competitive, and the offer is broad, in a lot of dimensions. That’s the beauty of it. The only difference is that in Europe and worldwide the playground is larger, which means you have more space, but a longer way to go to reach different people. What I believe is the key to standing out right from the beginning is having unique designs and a high quality of craftsmanship and leathers to be able to step up and satisfy the world. What is one simple thing that can always put an instant smile on your face? stay true to your heart and follow your dream. For more information on the details of her collection, Click here.